Slenderness is a defining characteristic of Hong Kong's tall buildings, and the city has more pencil-thin towers than any place in the world. In particular, in the 1980's, Hong Kong's high land values and liberal zoning laws spawned many districts of extraordinarily slender and densely-packed apartment towers such as the famous Mid-levels, where hundreds of speculatively-developed apartment buildings exploited the city's permissible maximum FAR of 1:18. Hong Kong apartment units are tiny compared to New York, and the crowding together makes for an extreme density of population, but those conditions are mitigated by the large preserved areas of natural landscape that cover the mountainsides. 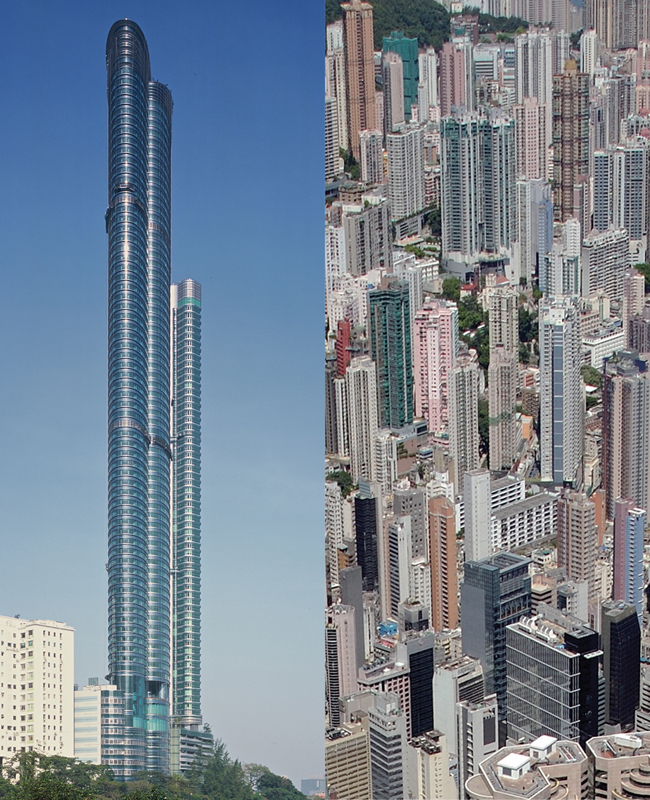 The most slender residential skyscraper in the world today is still Hong Kong's Highcliff, a 72-story tower completed in 2003. Designed by the Hong Kong architect Dennis Lau of DLN Architects and Engineers, with structural engineering by the Seattle-based firm of Magnusson Klemencic Associates, it rises 828 feet (252 meters) with an extraordinary slenderness ratio of 1:20.